I wish I was joking, but at one of the accommodations where I stayed in the Barousse Valley of the Pyrenees (I would never stay there again), I had to stand out in the field near the donkey to get phone or 3G reception. It became a running joke among the guests. Coverage of phone and 3G can be spotty in France just as it is in many countries, so I thought I'd share what I learned. Laptop: Internet connection (wi-fi), email, blogging, Skype (for very cheap phone calls), photo download and archive, mapping, route planning, hotel reservations. International phone with a French phone number: Local calls in France, texts, calls to the USA (about a third of the cost of calling on my AT&T iphone plan, but not as cheap as Skype which requires internet access). It was also nice to have a local phone number to give to my B&Bs or hotels, and to call friends in France. For some reason at certain locations, I would be able to connect to the internet with my laptop, but not my iPhone. Or I could only use my iPhone, but not my laptop. Someone can explain this to me, all I know is it was good to have all three types of devices listed above, because I used all of them at different times. In 5 weeks, I had perhaps 2 days where I felt disconnected. Which is not a good feeling. These days it is absolutely possible to have good communications, so choose hotels that have wi-fi at no additional charge. In France wi-fi is pronounced "wee-fee". The hotel should display a wi-fi symbol on their website, but be sure to ask as well. Also if you are an Apple user (like me), specifically ask if their clients can easily connect with an iPhone and laptop. With all the choices available today, you shouldn't need to go without. 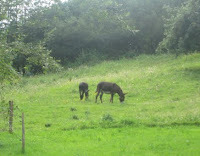 If they mention a donkey in the field, look elsewhere for accommodations! In advance of my travel dates I purchased both an international data roaming plan from my phone carrier (AT&T), and an international text plan. Within the 5 weeks I was able to use my limit of 50MG/month on an AT&T iphone international data-plan by using the 3G as little as possible. Also anytime I did get wi-fi connection I would download all emails so they would not download later while I was on 3G. I also purchased a 50 text plan/month from AT&T, that enabled me to send text messages from France. This plan is not listed on the AT&T website, you will need to call up an AT&T International Representative to ask for this plan. The plan that does show on their website is the plan for sending texts from the USA to Europe. Sort of confusing. Also be sure to keep data roaming turned off until you need it (read some other tips for traveling with your iphone). My family owns and shares an international phone that may be activated whenever we all travel, it is a CallinEurope.com plan. I am a mobileme user as well. Mobileme is online file sharing. That way no matter what hardware I use, or if I end up in a good old-fashioned cyber-cafe in Europe, I can always access my files. I have a private and a public (with approved access) mobileme account. I can leave my travel documents and information online so my family always knows where I am at, and can help if needed. I can easily access logos, photos, and documents. Even with all my gadgets, I still needed a human on the other end. It is indispensable to have a friend or family member at home who will answer your calls if you need assistance. When my accommodations did not work out (three times in the 5 weeks) I called home to my brother twice. He was able to locate a hotel for the night(s). He also confirmed a flight for me. Trying to do this on my own would have been stressful and easily absorbed 15-20MG of my data-plan and lots of time. I instead was able to spend the time driving to my next location. It is smart to have a contact at home and leave them your flight information (booking ID and passwords) and credit card payment information just in case you need help while on the go. One of the joys of traveling is realizing that I really need very little stuff in life. I never felt without during my 5 weeks in France. I had my bike, one suitcase, a picnic/food bag (with a wine opener! ), a bag with my cycling helmet, cycling shoes, cycling supplies, and all my gadgets. As long as I could communicate, had gas in the car, had my bike and good maps, I was perfectly content with very little. And yet so much.